Walt Disney Co. is set to unveil its new Disney+ streaming service this week, in what many observers see as a pivotal moment in the company’s history. “It’s a make or break strategic imperative for them,” Tuna Amobi, media analyst with CFRA Research, told BNN Bloomberg in a phone interview. Fresh off buying most of 21st Century Fox’s empire for US$71 billion, Disney hopes its arsenal of content will help it fend off technology companies such as Netflix Inc., Amazon.com Inc. and Apple Inc., which now all have film studios of their own and are becoming fierce rivals for traditional media companies. “It’s become increasingly clear Disney needs to have a direct-to-consumer (DTC) relationship,” Paul Sweeney, a senior media analyst with Bloomberg Intelligence, told BNN Bloomberg in a phone interview. To become a distributor, Disney acquired a majority stake in BAMTech in 2017. That business, now called Disney Streaming Services, has helped Major League Baseball, HBO, WWE and others launch successful streaming offerings. The direct-to-consumer technology also powers Disney’s ESPN+ streaming service, which launched last year and recently topped two million subscribers. “The success of ESPN+ certainly bodes well for our Disney+ service,” Disney CEO Bob Iger told investors at the company’s annual meeting last month. Along with Disney’s big spending on technology, it continues to ramp up content budgets to keep up with the likes of Netflix, which spent roughly US$12 billion on programming last year. “Netflix has a huge head start and they outspend everyone. But if any existing media company can compete, it’s most likely going to be Disney because they have so much great content,” Sweeney said. Excited fans include Netflix CEO Reed Hastings himself. "I know I'll be a subscriber of it for my own personal watching - the same way as many Disney and Fox executives also subscribe to Netflix," Hastings told analysts on a recent conference call. Iger, who has said the service will initially be priced “substantially below” Netflix, outlined at Disney’s annual meeting that the Disney, Pixar, Marvel, and Lucasfilm brands will fuel Disney+, along with National Geographic, which was acquired as part of the Fox deal. Iger described Disney+ content as a combination of “the old and the new”: The “old” being hundreds of library films and TV shows; and the “new” being headlined by Disney’s blockbuster theatrical releases. Some Disney films currently still stream on Netflix, as part of an expiring contract that dates back to 2012. But all Disney theatrical releases this year and beyond will head straight to Disney+ after their movie theatre window. The first of those films will be Captain Marvel, which has so far generated more than US$1 billion at the box office worldwide. Experts suggest Disney may eventually speed up the amount of time between when its blockbuster movies leave theatres and become available on the Disney+ service, to encourage more sign-ups. “Over time, I think the movie studios will shorten their theatrical windows,” Richard Gelfond, CEO of IMAX, told BNN Bloomberg in a recent television interview. Disney+ will also feature a steady slate of original films made exclusively for the service, such as live-action versions of the animated classics Lady and the Tramp and Sword In The Stone. Other high-profile reboots are also possible with The Parent Trap, Father of the Bride, Honey, I Shrunk the Kids, Three Men and a Baby, and Sister Act 3 being referenced in recent reports. Original television programs are also in the works, with Disney developing shows on everything from The Muppets and The Mighty Ducks to Pixar’s Monsters Inc. The entertainment giant’s most high-profile TV series production is The Mandalorian, a live-action Star Wars show from director Jon Favreau, which reportedly cost US$100 million for 10 episodes. A Star Wars Rogue One prequel is also said to be in the works. One thing to note is that Disney previously sold the broadcast rights to the first six Star Wars films to Turner Broadcasting, which will keep them off Disney+ until 2024. As for Marvel, Disney is working on new TV productions based around untapped characters, such as “Loki.” It’s not yet clear if recently cancelled Marvel-Netflix originals such as Jessica Jones, Daredevil, and Luke Cage will eventually resurface on Disney+ after a non-compete deal with Netflix expires. Meanwhile, Disney is developing oddball Marvel content with another streaming service, Hulu, which it now controls thanks to the Fox deal. That includes a new animated show about Howard the Duck. The strategy allows Disney to focus on family-branded shows for Disney+, while marketing edgier content through Hulu. Most analysts expect Disney+ to also be part of a wider streaming bundle, which includes Hulu and ESPN+. Indeed, JPMorgan analyst Alexia Quadrani said in a research note she sees a “path” towards 160 million global subscribers, with 45 million subscribers in the U.S. and 115 million subscribers in other markets. Netflix, by comparison, had roughly 139 million paying subscribers worldwide at the end of last year, with more than 58 million of those subscribers in the U.S. The speed at which Disney ramps up its subscriber base could be affected by a few factors. Since Disney has traditionally licensed shows to other distributors, it will take time to recover all of its preferred programming rights worldwide. Disney Channel, for example, offers an impressive library of content for streaming. However in Canada, JPMorgan’s Quadrani notes Disney Channel has a multiplatform deal with the media company Corus Entertainment Inc.
Another issue depends on how many people sign up for Disney+ through third parties, such as Apple’s App Store, which would take a cut of Disney’s revenue. Disney may try to encourage more people to sign up directly through its website. 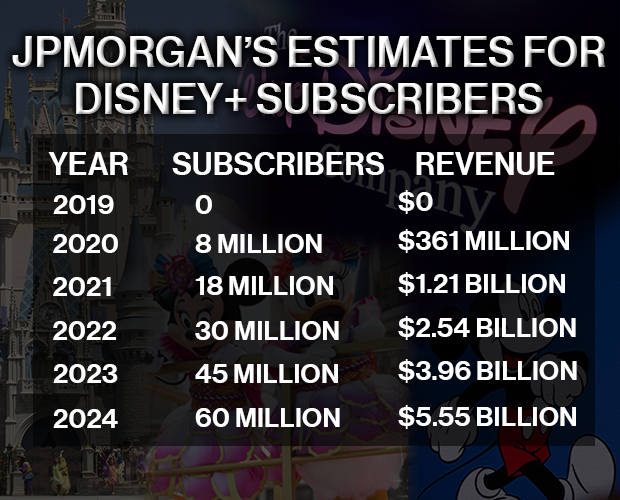 Ultimately, Quadrani expects Disney+ to breakeven by 2020, when she estimates it will reaches 30 million subscribers. Disney needs scale to make up for its lost annual licensing revenue. UBS estimated Disney's film and TV licensing to be worth US$2 billion a year, while its deal with Netflix is worth about US$500 million annually. Meanwhile, content is just one of the advantages Disney may have in building a successful streaming service. The company’s marketing machine will be in full swing, with Disney+ promotions potentially tied to its theme parks, cruise ships and retail stores. “It certainly gives them a leg up. They can promote their services across all their properties – broadcast television, cable networks, giants like ESPN. You could argue nobody promotes their brands better than Disney,” said Bloomberg Intelligence’s Sweeney.